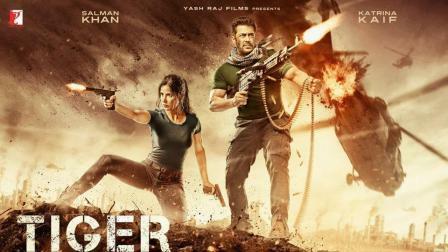 There are gunfights, there's horse riding, there's muscle game, mind game, punches, and punchlines -- the trailer of Salman Khan's "Tiger Zinda Hai" shows that the superstar, along with Katrina Kaif, is back with a vengeance to delight his fans and give a message of peace. Directed by Ali Abbas Zafar, the movie brings back the 'Ek Tha Tiger' on-screen couple Salman and Katrina. The team of 'Tiger Zinda Hai' shot extensively in Abu Dhabi for a 65-day schedule from May 4 at multiple locations in the city. A set was being designed by some of those workers who helped to build the "Star Wars" set in 2013. While seeing the trailer, one can notice that Abu Dhabi has been used as a location for shooting the portions of the war-torn Iraq. "There are many hunters, but no one can hunt like Tiger," says one of the punchlines in the action-packed trailer, launched on Tuesday. The story of the film revolves around a mission to rescue 25 Indian nurses who are kidnapped by the world's most deadly terrorist organisation headed by Abu Usman in Iraq. Interestingly, in this film, Indian agent Tiger and Pakistani spy Zoya work together to release the hostages. In a pertinent statement, Katrina's Zoya says: "Our mission is not just to save these 25 nurses, but to tell the world, we stand for peace". For Salman, message-based cinema seems to be the way to go now, as he did the same with "Bajrangi Bhaijaan" and "Tubelight". The trailer of "Tiger Zinda Hai" looks quite promising not only for Salman's fans, but also for the audience who love watching action-packed war films. With its stunts, visual effects and exotic locations, the film, which has been shot across five countries, seems to have a lot to offer. However, the hostage plot reminds of Akshay Kumar's "Airlift". During the launch of the trailer here at the Yash Raj Films (YRF) Studio on Tuesday, Zafar was asked if he feels the pressure to deliver the best in one of the most anticipated films of the year. He said: "Yes, there is a pressure on me because it is a successful franchise and I have worked with Salman Khan in 'Sultan', and we succeeded. So even people have a high expectation. The story is based on a real-life incident, and it's an impactful story. Let's just hope that this Christmas, we can all have a great time in the theatre." Asked about Salman and Katrina's chemistry in the film, Zafar said: "It's different from the first one. It is not a love story between Katrina and Salman but two people on a mission to stand for peace. This film has more action and the story is realistic and topical, that we can all relate with." Produced by Aditya Chopra, the film also features Angad Bedi and Girish Karnad. It is releasing on December 22.